Geodyssey is off to a great start! Since Friday, the site has had over 17,000 page views from more than 1,200 users in 41 different countries. The most remote from me here in South Florida was a visit from someone in Norfolk Island. Please help spread the word about Geodyssey to your fellow puzzleheads by forwarding this message and reposting on your social media network of choice. 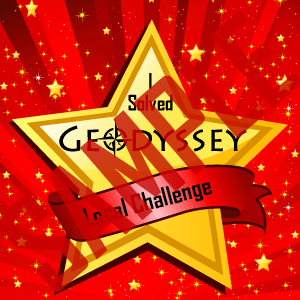 The solver badges are available on the final page of each challenge. Feel free to download them, use them as avatars, or in any other way you like to prove your puzzleheadhed prowess. The Local Challenge hasn’t been completed yet. If you’re in South Florida, you’ve still got a chance to be the first one to locate it. Geodyssey is off to a great start! Since Friday, the site has had over 11,000 page views from more than 1,000 users in 36 different countries. It even earned a mention on the Geocaching Puzzle of the Day site. As people began using the site, I did my best to listen to all of your comments, direct and indirect. Thanks to you, I was able to patch some bugs in the way some directions were worded, add additional clarification where some was needed, and add some convenience links to help you spend more time solving and less time clicking and typing. If you see an issue, please use the Contact form on the site to let me know, and I’ll do my best to make it right ASAP. Also, on February 2, Groundspeak switched the format of the log entries on geocaching.com. Instead of enhancing entries with raw HTML, the logs now use the Wikipedia-style Markdown syntax. This had the unfortunate side-effect of breaking the Remote Challenge clues. I’ve since updated the clues to use the new style – if the relevant log entries for a page on geocaching.com don’t look right for some reason, try reloading the page. And if they still don’t look right, please let me know. What do the title of this post and bold-faced section headings (other than the heading of this section) in this message have in common? I’m putting the finishing touches on a brand new puzzlehunt which I plan to release to the world on National Puzzle Day – January 29. If you liked my Puzzle Solving 101 Series, I think you’re gonna like this new one. It’s not going to be a new series of geocaches, but it’s got a fair bit of geocaching elements to it. But you don’t have to be a geocacher to enjoy it – it’s designed for the cachers and muggles alike. Although there will be a local aspect to it for people who can get to South Florida, there will be something in it for you no matter where you live. The old version of this site had been hacked and flooded with spam several years ago, and my attempts to thoroughly clean up the results of that hack were unsuccessful. As a result, I’ve moved the old version of this site to old.puzzlehead.org. All of the URLs that used to point to this site should work on that site if you change “www” to “old” in the URL. All comments and registrations on the old site have been disabled, and I’ve patched the system as best I can, so hopefully that will slow down the nonsense. I’ll be slowly rebuilding the new site out of the pieces of the old. Stay tuned!